Visor on, footwork ready - go get 'em. Opt for the warm main pool or one of the even warmer hot tubs. Even if it's on the brisk side, throw on a few extra layers and spend a few minutes outside. Break out the board games - there may be a new Catch Phrase champ in your midst. Put dinner duty in the capable hands of your crew's best griller, and enjoy. The Steamboat gondola is a 13 minute walk from the resort – what are you waiting for? Escape the cold with a relaxing swim in the outdoor heated pool. Recover from your day with a soak in the hot tub – the resort has 2. Fill your water bottles and check the kids' laces. Spring Creek Trail is just 8 minutes drive from resort. Warm up on the driving range before hitting the course at Rollingstone Ranch, less than 6 minutes drive away. A short, complimentary ride to the ski village tops the list of Timber Run’s favorite guest features. No remote parking lots – just grab your gear and go. But first, check to make sure the kids have the right gloves, sunscreen, lip balm, gaiters, hand warmers and energy bars. Whew. All set? Shuffle your way out the door, grab your gear from the ski valet and head mountain-ward. The outdoor pool and three hot tubs are yours for the splashing and soaking year-round. And summer comes with a few extras, like the onsite tennis court and BBQ patio area with picnic tables for feasting al fresco. Appoint a grill-master to man the grill while you toss together some easy sides in the kitchen. Weather not cooperating? Move to Plan B. Hop the free city bus and grab a bag of tacos from the walk-up window at Tacos Del Barco, and dig out the chips, guac and salsa you have stashed in the kitchen (assuming the late-night snackers haven’t already discovered it). A gratis bottle of wine awaits in your vacation condo, available in options ranging from one- to three-bedroom layouts, plus a three-bedroom loft plan if you need the extra space. Individually decorated residences include full kitchens, plus a breakfast bar and dining area – quite possibly the scene of a semi-serious tussle over that last piece of lasagna. (Nothing a quick thumb war can’t solve.) Headed out? The concierge team is there to point you in the right direction, whether you’re looking for ice skating or the area’s best ice cream. Laying low? Sip drinks on the balcony if it’s warm enough. Or flip on the gas fireplace, and claim your respective sofa spots for movie night. Best known for its (trademarked!) 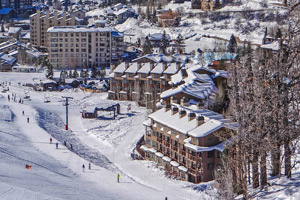 Champagne Powder®, Steamboat is more than just a ski destination. The mountain village and downtown are both action-packed with a year-round calendar of activities, festivals and events. Across the Yampa River, and near the downtown, historic Howelsen Hill is one of the country’s oldest ski areas in continuous use, and the only ski area listed on the Colorado State Register of Historic Places. Dozens of winter Olympians have trained on its slopes and jumps. Today, it’s a crowd favorite for snow tubing and The Howler Alpine Slide, a speedy, 2,400-foot run of banks and turns. While you’re downtown, check out (also historic) F.M. Light & Sons, which has been “Outfittin’ the West for over 100 years.” Cowboy hats, boots, wool flannel shirts and souvenir goodies abound.